While many people know of the numerous culinary uses for a garlic bulb, not as many people are aware that the garlic plant has more than one edible part. A Mature Hardneck Garlic Bulb is “cracked” or broken apart to reveal the individual cloves of the garlic bulb. This individual clove is planted in the soil, where the garlic bulb grows underground where it begins it journey, soft and onion-like. As the bulb starts to grow larger and gets harder becoming more like the garlic we know, a shoot pokes its way through the ground. The shoot then sends up a flower stalk. During the early growth period the shoot is long and thin, and flexible enough to curl into an elegant tendril. This stalk will curl up as it grows and form one to two curls. This stalk from which the flower and seed head would grow if garlic formed seeds is known as a garlic scape. Garlic scapes are always smooth, round, and solid throughout their entire length. The scape has no leaves except for a leaf like bract that encloses or suspends a cluster of flowers and bulbils. At the start, this immature flower stalk is somewhat tender and very flavorful, although the stalk never does reach the same level of pungency as the garlic bulb itself, yet, it can be used in place of garlic in cooking making it an ideal ingredient in a number of dishes which need a subtle touch of garlicky-ness. However, as the plant continues to mature, the garlic scape gradually begins to straighten and harden off. At this point in time, the garlic scape is much tougher and ceases to be usable for most recipes. While the scape is no longer edible once it’s hardened off, it will produce Bulbils which are essentially miniature cloves of garlic which can be eaten or used to grow green garlic the next season or in two to three years full size garlic bulbs. Fortunate for connoisseurs of garlic, most garlic growers will harvest the garlic scape when it is at this young tender curled stage before the bulbils develop, redirecting the plants energy growth into developing a larger mature garlic bulb. 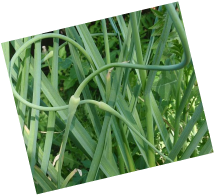 Now that you know that the globular garlic bulb root isn’t the only edible part of the plant, you must be wondering: Where can I get garlic scapes? When are they available? How do I store them? And, what are the benefits of eating scapes? The green shoots that grow up into elegant curlicues, more properly known as “scapes,” are fast becoming a staple on the tables of backyard gardeners and farmers’ market shoppers. While most large groceries do not stock garlic scapes they can often be found at your local farmers markets for sale. The season for garlic scapes is very short; they emerge from hardnecked varieties of garlic in late May and can be harvested through the middle of June. While the availability of scapes has a short season, you will be happy to know that garlic scapes store well, though freshly cut scapes taste the best. Place scapes in a paper bag, this will stop them from turning into a slimy science project wrapped in plastic, and keep them in your refrigerator for approximately a month or a little longer; beyond this time they begin to wilt and shrivel up. If you want to extend the time-period of storage, they freeze well, too--blanched or not--but they tend to lose some of the garlicky heat during storage. You can remove the stalk tip above the pod before using; some people use the whole scape, but the pod and tip are more fibrous than the tender stalk. This flavorful flower stalk packs a major nutritional punch for a mere 30 calories per three ounces. They are high in fiber, Calcium, Vitamin C and pro-vitamin A, which protects your skin and lungs. Like the full size garlic bulb clove, they have been reported to help prevent heart disease, high cholesterol, high blood pressure, and cancers. Contained within the garlic scape is a great deal of flavor; they have a taste that is milder than the garlic cloves, and have a broad spectrum of uses from soups to salads to garnishes. This delectable curlicue will add a subtle taste of garlic to a recipe that calls for onions and provide enough of a bite to fulfill the purpose of the onion. The garlic scape is an allium delicacy that is highly prized and traditionally used in Southern, Eastern European, Middle Eastern, and Korean cuisine because of its subtle garlic flavor and tender-crisp texture. It can be chopped into short sections and added to stir fry recipes; the flavor of the garlic scape adds a mild aroma as well as taste to the stir-fry, readily combining with the other ingredients. The garlic scape also has a place in many different pesto recipes where it provides just a hint of the garlic flavor to be pleasing in the sauce. The tender young scape can also be chopped and placed into a salad, sprinkled into scrambled eggs or added to your other favorite vegetable side. Or, it can simply be sautéed in canola oil, then sprinkled with salt and pepper and enjoyed by itself. Alone or in a recipe the delectable scape can fulfill your springtime garlic cravings. Remember the season for the garlic scape is short, so check out your local farmers market or your online resources often this coming spring. Watch for our next article on Garlic Bulbils. Some call it Green Garlic; others know it by Spring Garlic and in my humble opinion it’s just Baby Garlic. No matter what name you give it, everyone should know about this young immature garlic that is harvested before the cloves have begun to divide. The tender young stalks are fully green, typically about one foot long, and therefore the bulb resembles that of a green onion or a scallion, rather than a segmented head of mature garlic that most people are familiar with. Many large grocery stores do not stock Green Garlic; however it can often be found for sale at farmers markets starting in the early spring time. When shopping for it, you want to select only the sturdiest and crispest stalks that do not appear wilted, and you should also check for mold and mildew on the stalks as this would be a sign that it was not stored correctly and could adversely affect the flavor. You will only be able to store it in the refrigerator for three to five days, therefore make certain to use it up as it will not cure and dry down like full size mature garlic. With a little extra effort Green Garlic may last longer when stored in a glass of shallow cold water which you must change out daily. You may however want to grown it at home as it is relatively easy to grow from larger garlic bulbils, such as Rocamboles, or from the small cloves from seed garlic. It can be planted shallow and mounded like one would do with leeks or rather deep to have more of the tender white stalk available. We have planted them as deep as five inches and had the tender stalks come up beautifully. Green Garlic, unlike its mature garlic bulb parent, is a ninety day plant and not length of day sensitive. While the full size garlic bulb is a long day plant which requires the long days of June for it to mature, Green Garlic can be planted in successive increments allowing you to have a continuous supply of fresh garlicky goodness all summer long and into late fall. The bulbils or small cloves from seed garlic can be planted in the fall allowing you to have the earliest possible spring crop. The flavor of Green Garlic continues to be garlicky, however is much milder with less of a pungent bite then matures garlic cloves. When cooked, it sweetens in the same manner as mature garlic, giving a new layer of depth to a dish. In contrast to mature whole bulbs of garlic, the entire plant, including the leaves of Green Garlic is often used in cooking. It may be used raw or cooked in an exceedingly broad assortment of cuisines. If you are feeling adventurous this coming spring check out your local farmers market or online resources for Green Garlic and give your taste buds a little kick. Look for our article on Garlic Scapes.